The 3 Best Batteries For An Off-Grid Energy System and a Dead Simple Trick to Slash the Cost!! Anyone serious about using alternative energy will need to know…. What are the best batteries for an off-grid energy system? However, in most cases, installing a renewable energy system requires a considerable initial investment that you won’t recoup for several years. One of the biggest costs associated with alternative energy systems is the batteries themselves in the battery bank, so choosing the right batteries for your off-grid system is crucial (and keeping the batteries alive as long as possible is also critically important)! Before we tell you what 3 batteries we recommend for your alternative energy system’s battery bank… It’s very important to note that you don’t have to buy them brand new. This method saves a huge amount of money when building a battery bank and makes the reality of alternative energy much more accessible to anyone! 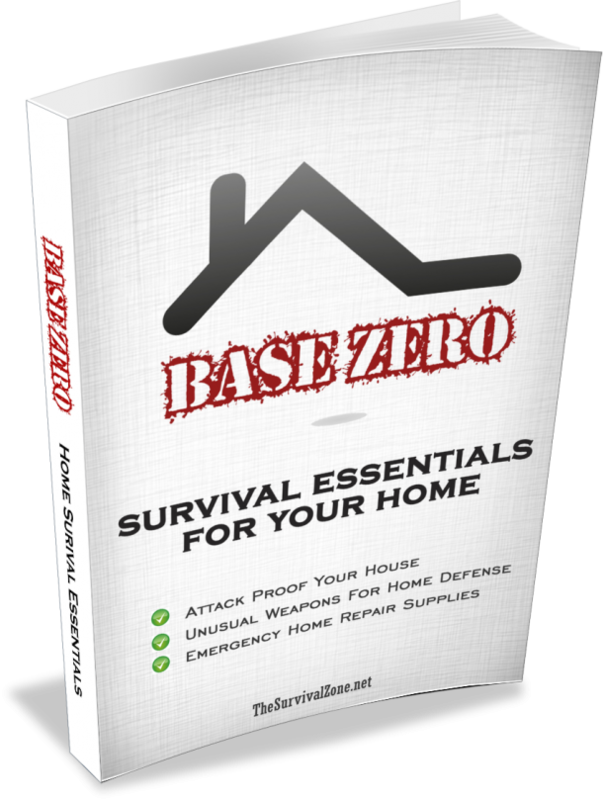 Virtually any other kind of battery can also be fully revived – making this one of the fastest growing skills that preppers and off-gridders are learning now. We’ll tell you more about how to do that later in the article! What are the best batteries to use in your solar power, wind power, or other alternative energy system? Most batteries that are used in renewable energy systems were originally designed for other purposes. The main example of this is the lead-acid battery which has dominated the industry for many years. They deliver more consistent performance than other batteries. The fact that they are so popular also means that they are pretty easy to replace if needed. As of late, lithium ion batteries for residential alternative energy systems, like Tesla’s Powerwall, have been gaining ground – but the initial expense for lithium ion batteries is still massively more than the initial investment into lead-acid batteries. The Powerwall may eventually change this, but for now deep cycle lead-acid batteries are the cheapest and most practical solution for a home battery bank. A while ago when the renewable energy industry was still picking up steam, people who wanted to go completely off the grid would often have to improvise and make do with car batteries. Car batteries however were never built for this purpose and should not be continuously drained and recharged (which is what they need to do in a solar panel or wind turbine system). 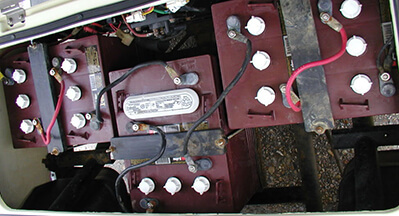 Car batteries are designed to be used only for starting and ignition. If you take a peek inside one, you will see that they have a large number of thin plates. These plates have a big total surface area that can facilitate a large number of chemical reactions. When you start your car, these reactions produce the sudden burst of power that is needed for ignition. Deep cycle batteries on the other hand, have thick lead plates that don’t give much room for chemical reactions. Though they produce less current, they are designed to do so for a much longer period of time. Basically, car batteries are “shallow cycle” batteries that will quickly burn out when used as storage for renewable power. 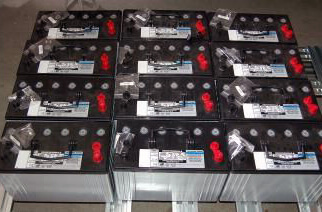 Flooded lead-acid batteries (FLA’s) are preferable to sealed lead-acid batteries (SLA’s) for renewable energy. Some people initially opt for SLA’s because they require little maintenance unlike FLA’s that need to be checked regularly for water level; SLA’s that are used properly can be left alone. 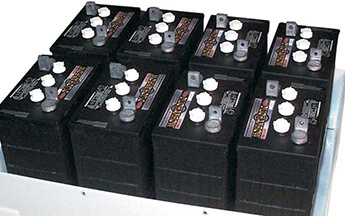 But sealed lead-acid batteries have two big flaws; they are sensitive and they wear out quickly. So if you’re planning on using your solar panel or wind power system every day, in time will pose a big problem. 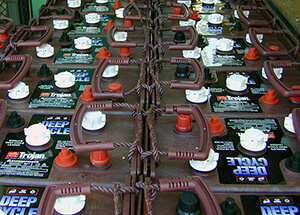 Golf cart batteries are the most widely manufactured batteries on this list. They also work great in an alternative energy system application, so it’s no surprise that they’re one of the most commonly used batteries in battery banks for renewable energy systems. The five to six year life span of golf cart batteries may strike you as relatively short, but they more than make up for that down-side by being extremely durable and cheap. Also, golf cart batteries can be found almost anywhere, making them a great choice for battery banks. 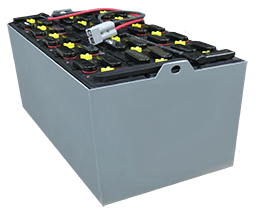 A battery bank that uses industrial batteries won’t rely on multiple strings of smaller batteries (like golf cart batteries); you’d use only a few or even just one battery to store all of your energy. Because these batteries aren’t usually manufactured to standard dimensions, you will have to have one made that is just right for your needs, or you can try to find an old industrial or forklift battery that’s the correct size for your system and use that. 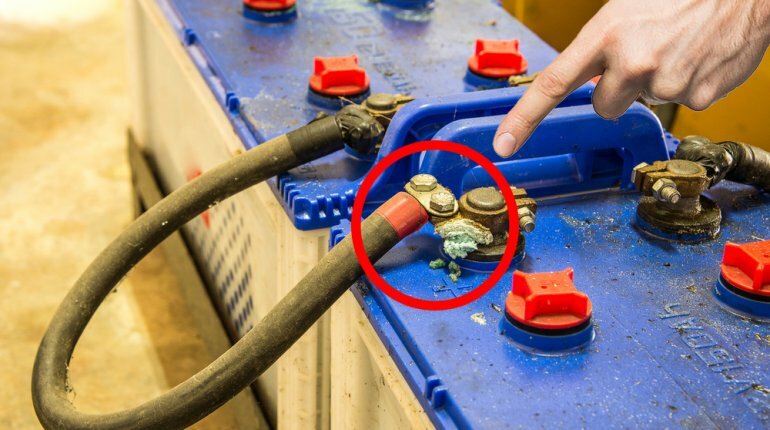 Like golf cart batteries, there are sometimes ways to get free or cheap forklift batteries; try calling up or visiting industrial companies and see if they have old or “dead” forklift batteries. Offer to dispose of it for them or pay them a little bit. If they agree, you can then recondition the battery and use it instead of fronting the cost of a new industrial battery. You can choose to get a new custom made battery instead, although expect to pay quite a bit – but the good news is these types of batteries are typically built to last 15 to 20 years. These bigger batteries will be heavier and more difficult to move around. There may be advancements in battery technology that could make the battery obsolete in years to come. If you don’t mind making the upfront investment (anywhere from $2,000 to $10,000) and are ok spending the time maintaining your batteries in top condition, then industrial batteries might be a good choice for you. If you want batteries with a little more capacity than golf cart batteries but without the large expense of industrial batteries, L16 batteries are a good middle ground. These flooded lead-acid batteries were originally designed for supermarket floor scrubbers. They last a bit longer than golf cart batteries – about six to eight years. However, they are often twice as heavy and the 6-volt models can be twice as expensive. But by sticking to any of the three batteries types mentioned above, you’ll be able to configure a battery bank that’s right for your needs whilst safe in the knowledge that you’re using the best for the job. Over the next couple years exciting new developments, like the lithium ion Tesla Powerwall will develop and grow, but for now our three favorite batteries for residential off-grid, alternative energy systems are golf cart batteries, L16 batteries, and industrial batteries. If You Need to Learn One Skill for True Battery Self-Sufficiency… THIS IS IT! It’s not just battery banks…. Whether it’s the battery in your vehicle, your machinery, your laptop, your phone or the AA’s that power nearly every torch, remote and god knows what else you have around the place, your cells just keep running out and needing replacing. It’s estimated that the average person spends around $15,000 in a lifetime on batteries alone! But there is another way! American Tom Ericson recently released a revolutionary Battery Reconditioning program which teaches people how to recondition their old batteries and bring them back to 100% of their original working condition. And you can learn to do it RIGHT NOW! It’s recently featured on CNN and Fox News, and around 20,000 people are already enjoying the benefits. Don’t miss out on this before it’s gone….It’s time to act quickly and learn more about the battery revolution! The above is an affiliated link and helps the theSuvivalZone.net stay free to use, as it is tracked to us. If you go through it, it can sometimes result in a payment or benefit to this site. The link will never negatively impact the product, nor does it affect the price of the product in any way. Our editorial line is not impacted by these links; we feature any available products that we think may be of interest to our readers whether or not the items are affiliated. This site is not a part of the Facebook website or Facebook Inc. Additionally this site is NOT endorsed by Facebook in any way. FACEBOOK is a trademark of FACEBOOK, Inc.